Within the Ceremonial Magick Traditions every piece of clothing and jewelry has its own intent, meaning and order in which it is put on prior to ritual. Although there is not such rigid structure within the Wiccan Path, I have always felt that it is important to begin your intent as early on as possible before magickal work. And, this would also including “robing up”, as we often say when it is time to get ready. When we put on clothing and jewelry that is specifically dedicated only to be worn in sacred space and working it helps to transition the mind into the head space that something important and different is about to happen. It is for this very reason that we wear special clothing for weddings, funerals, to impress at a job interview, etc.. A portion of this process is the visual impression offered to those seeing us, but at the very fundamental roots of cause it is our own signal to shift gears and get into a different mode of thinking. The same is true with ritual clothing. We are donning outer garments that will be a reflection of the inner work we will be doing. The care and keeping of these tools that become an extension of ourselves in much the same way as that of our magickal tools should be executed with thought and care. Keep your ritual clothing clean, in good shape and protected in a garment bag, beautiful wooden box or other place of your choosing. Covering and separating these from mundane wear is a good practice as these garments will, to some degree, pick up the energy of the ritual space in which they were worn. 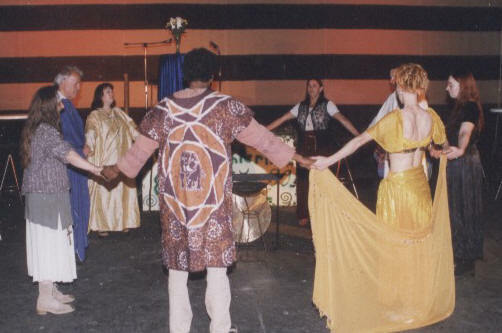 No matter how enjoyable or potent a ceremony may have been, removing the ritual garb and re-clothing in mundane wear brings your mind back to the place of the present moment and physical space to begin the process of adequately grounding excess energy. It would be ill advised to remain in the head space of ritual all the time. A ritual robe is a highly personal statement of how you wish to present yourself before the seen and the unseen. Traditionally, it would have be sewn and fashioned entirely by hand and by yourself. This is still preferable, although it is understood that everyone has different abilities with a sewing machine, needle, cloth and pattern. If you start with the basics of what you would need in a variety of settings a simple black and another simple white robe would fit the bill. Some witches wear the black robes during the dark half of the year and the white to signal the transition into the Light or waxing year. Colors and patterns can always be added later. Some sew specific sigils or embroider or bead the neck or sleeves of the robe to further enhance the energy they have been working towards. As to what is worn beneath the robe, that again is a personal and oftentimes practical consideration. Naked underneath and barefoot in ritual are very empowering, but if the ritual is out doors in 50 degree damp weather in the woods, warm clothing and shoes are a definite must. Remember we did say that the body is a temple and should be honored. Keeping yourself warm and dry goes much further in allowing your focus and intent to remain, than “looking the part” but being completely disconnected because of physical discomfort. Be creative in what you choose and pick or create something that expresses you. This will be a piece of ritual clothing you will wear and use often. A cloak over the robe is another option that many witch’s select. Typically, when outdoors the cloak served as warmth and a certain amount of camouflage in the darkness of night. Historically, the cloak was the first type of outer garment worn for many of the reasons above. There are many beautiful selections for cloaks nowadays beyond the simple woolen black or dark weaves. There are many options available for finding just the right ritual wear. Stores that are Celtic themed often have appropriate clothing. This is also a reason why the Ren Faires are so popular with pagans for finding ritual garb. And, don’t forget that Halloween stores often reveal treasures that are affordable in price and fit the bill nicely. 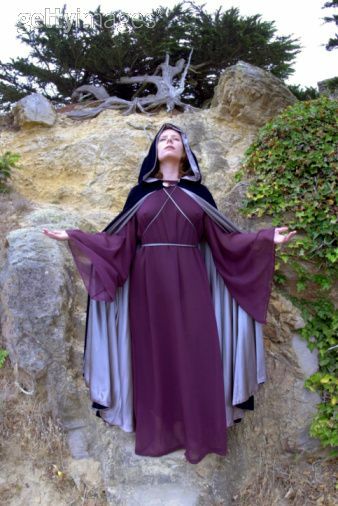 My first black robe (with attached hood) was purchased at a Halloween store and I have used its simple shape as pattern for many other robes. This has served me well for more than 15 years! 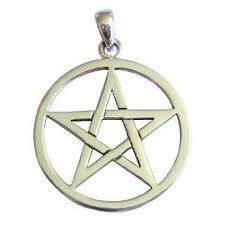 An amulet or magickal pendant worn in ritual space goes well beyond just a pretty piece of jewelry. It can serve as an anchor for the collective experiences of the rituals you’ve attended. 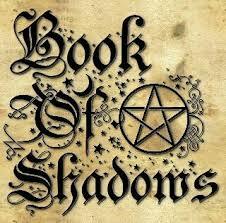 It can hold specific energy as needed for your magickal working. And much more. The choice of sigil or symbol should be made with intent and you should not simply choose an amulet because you think it looks good. If you are drawn to a particularly symbol, do the research and find out what its meanings are and how they fit into what it is you are wishing to create around yourself. If you choose to select a god or goddess image for your amulet, be sure you know what type of energy that Deity encompasses. Sekhmet, although a popular choice has a very dynamic and powerful energy that may be too potent for most to have nearby for every working. Take your time in making a selection and once you have settled on what best expresses you, the amulet should not be worn for anything other than magickal work. Clean it regularly and keep it in a protective case when not being worn. In addition to an amulet, some also dedicate a ring to be worn during magickal work. The ring may have a specific stone or crystal set into it that acts to balance, energize or stabilize the energies within the witch. In some Traditions, the magickal ring is received as confirmation that a specific high level of initiation has been received by the adept or magician. This ring holds the power of that initiation and is reminder of the oaths and responsibilities that are inherent in holding that position. Whatever your choice in jewelry and ritual wear, be specific in what statement is being made, research the meaning and symbology behind your choices before settling on anything specific and then clothe yourself in the integrity and honor that wearing these symbols of your Path requires. This entry was posted in YAD-Lesson Seven, Year and A Day Course and tagged amulets, Deity, Devotion, ritual clothing, YAD-Lesson Seven, Year and A Day. Bookmark the permalink.